Kyustendil (Bulgarian: ) is a town in the far west of Bulgaria, and the capital of the Kyustendil Province. The town is situated in the southern part of the Kyustendil Valley, near the borders of Serbia and the Republic of Macedonia; 90 km southwest of Sofia, 130 km northeast of Skopje and 243 km north of Thessaloniki. The total population counts 44,532 people, with a Bulgarian majority and Roma minority. During the Iron Age, a Thracian settlement was located within the town, later known as Roman Pautalia in the 1st century AD. In the Middle Ages, the town switched hands between the Byzantine Empire, Bulgaria and Serbia, prior to Ottoman annexation in 1395. The town was liberated in 1878 from the Ottoman Empire. It is named after Konstantin Dragaš, a 14th-century regional lord. Kyustendil is a national balneological resort at an altitude of 600 metres. There are more than 40 mineral springs in the town. The waters have a high content of sulfite compounds. These are used for the treatment of the locomotory system, gynecological and other kinds of diseases. The resort region includes several baths, balneological complexes and others. 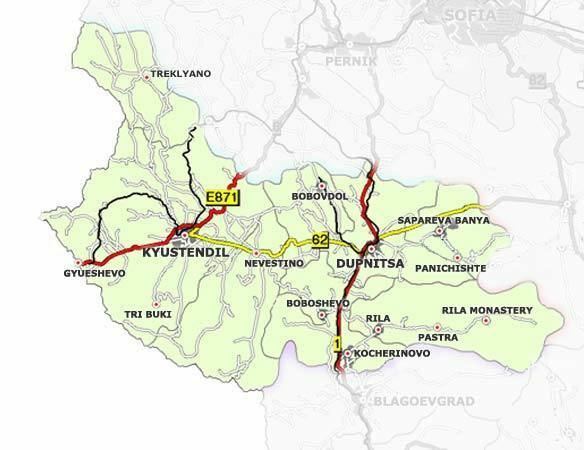 Kyustendil is located at the foot of the Osogovo mountain, on both banks of the Banshtica River and is a well-known centre of balneology and fruit growing. 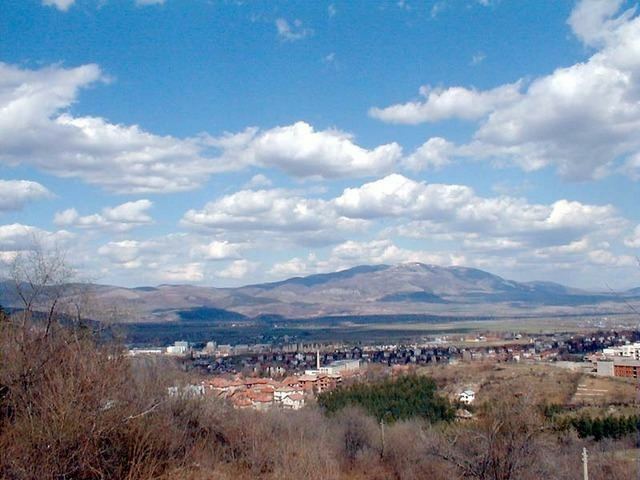 The town is 90 kilometres southwest of Sofia, 69 km northwest of Blagoevgrad and 22 km from the border with the Republic of Macedonia and Serbia. The fortress was built by the Romans. Thermae, basilicas, floor mosaics have been uncovered. A Thracian settlement was founded at the place of the modern town in the 5th-4th centuries BC and the Romans developed it into an important stronghold, balneological resort and trade junction called Pautalia (Thracian for "town of springs") in the 1st century AD, when it was administratively part of Macedonia. Many Thracian and Roman objects are exhibited in the towns Regional History Museum, most notably an impressive numismatic collection. A fortress was built in the town in the 4th century (known by its later Ottoman name Hisarlaka). Kyustendil today belongs to the Sofia diocese in regards of church-administrative structure. The city is the center of the vicarage and the Kyustendil Eparchy. In the past, Kyustendil was the seat of the diocese, that latter was closed in 1884. The majority of the urban population profess the Orthodox faith today, there are several Christian denominations associated with Protestantism and a small Jewish community. During Ottoman rule Kyustendil had mostly Turkish population profess Islam but of the many mosques of the time, are now saved only two. Today the city has only Christian churches operating.